*** The operating room fees DO NOT include the price of any implants or supplies, which will be an additional fee. Please note that physician services provided in the ASC are not included in the ASC's operating room charges. Accordingly, you will receive separate bills for the services of physicians, which could include but not be limited to, your surgeon, any assistant surgeon, anesthesiologist, radiologist, laboratorian or pathologist. These physicians may or may not participate with the same plans as the Rye ASC. Therefore, you should check with the physician who has arranged for your services to determine the health plans in which the physician participates. You will also want to check if the physician will be using an assistant surgeon so that you can confirm the health plans with which the assistant surgeon participates. The Rye ASC has a contract with WESTMED Medical Group (WMG) to provide laboratory, pathology and radiology services. We recommend that you contact WMG to determine if that practice is a participating provider in your health plan. 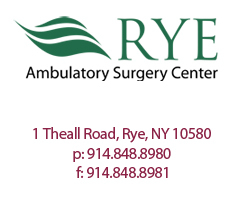 For additional information, we suggest that you review the following documents which can be found in the “Patient Information” section of the Rye ASC website. If you have additional questions, or would like to request a written estimate of the amount you will be billed by the Rye ASC for healthcare services to be provided, please call 914-848-8980.